Spectacular single level 4-bedroom, 4.5-bath Shady Canyon custom estate on a sunny half-acre-plus corner lot. 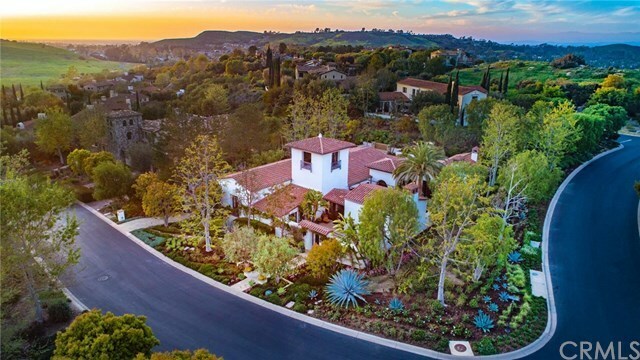 Approach this Santa Barbara style home through a large-walled courtyard with fireplace, and enter a foyer--leading to another private courtyard with a seating area & fountain on one side, and a large living room with fireplace on the other. Follow on to a formal dining space with wine room, deluxe chefâs kitchen, casual dining room, and a family entertainment room with beamed ceiling & fireplace. The stunning master bedroom provides its own sitting area, spa-quality bath, and extra-large closet. Each guest bedroom is en-suite; there is also a separate powder room. Every room in the home showcases views of the beautifully-landscaped lot. The rear of the property is an entertainerâs dream: including a manicured lawn, fountain, fireplace & sitting area, a generously-sized dining space with retractable canopy, and a separate patio bar with BBQ & wide counter for seating. Last: the enchanting tower, which offers sitting room & separate artistâs studio/loft. 36 Black Hawk is a stunning one-of-a-kind home in a special one-of-a-kind neighborhood. Directions: Shady Canyon Drive to Copper Creek. Take Copper Creek to Black Hawk, turn right. 36 Black Hawk is the first home on your right.